World class athletes in every category from lighter style Men’s Physique through to the super heavyweight Men’s Bodybuilding stars. An international event with the top amateur guys from around the world. The 2013 IFBB Arnold Classic & Arnold Sports Festival are Presented by Classic Productions.Celebrating the 25th Anniversary of the Arnold Classic. Held at the Greater Columbus Convention Center and the Veterans Memorial Auditorium, Columbus, Ohio on February 28th to March 2nd, 2013. This massive contest DVD of over 4 hours has something for everyone. It is the BIGGEST men’s contest DVD we have ever offered. There are world class male athletes in every category from lighter style Men’s Physique through to the super heavyweight Men’s Bodybuilding stars. This is an international event with the top amateur guys from around the world. See all of the lineups, key comparisons and callouts plus posing by the top guys, and all awards and posedowns. A stand-out and overall Men’s Bodybuilding winner was EMILIANO DELL’UOMO from Italy. Pictured front cover main photo. See all Class and Overall winners listed below. AMATEUR MEN’S PHOTO GALLERY. 18 photos including all class and Overall winners. See the 2013 Arnold Amateur Championships: Amateur Men’s Report by Andrew Michalak, courtesy The Arnold Sports Festival. Click here for the COMPLETE 2013 ARNOLD CLASSIC PRO EVENT RESULTS. 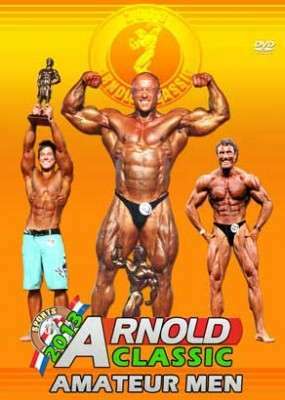 See the COMPLETE COLLECTION OF ARNOLD CLASSIC DVDs & PAST WINNERS. Click here for the COMPLETE 2013 ARNOLD AMATEUR RESULT – MEN AND WOMEN. OVERALL MEN: Emiliano Dell’uomo (Italy) Pictured right.